Rudolf Steiner painted his Archetypal Plant watercolour in 1924, at a time when contemporary scientific methodologies were emerging and nature was being examined under the microscope. In contrast to the dissecting tendencies of natural science, however, Steiner’s painting depicts the living, dynamic potential which stands behind the plant – lifting us out of the specific genus and providing an image of the growing and formative forces inherent within each individual plant. 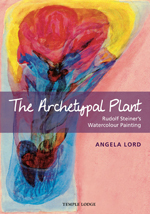 Researching Rudolf Steiner’s painting of the Archetypal Plant can help reconnect our outer sense-perceptions with the inner realm of imaginative cognition, releasing us from the spell of matter. To support and enliven such research work and processes, Angela Lord surveys her subject-matter from various aspects, including the historical, evolutionary relationships we share with plants; the representation of plants in art and architecture; plant myths and legends; poetry inspired by flower imagery; cosmic aspects of nature, including earth’s relationships to the sun, moon, planets and stars; formative, creative forces of colours and their relationships to plant forms; and finally, working artistically and painting the Archetypal Plant motif itself. In developing a broad overview, the author forms a deeper, more complete picture of the plant world, paying homage to its diverse characteristics, and stimulating new perceptions and perspectives. This book is richly illustrated with full-colour images. ANGELA LORD is a painter, interior colour designer, muralist and art educator. Born in Christchurch, New Zealand, she studied with Gerard Wagner at the Goetheanum Painting School in Dornach, Switzerland. Together with Robert Lord, she is active in Colour Transformation Ltd., a company specializing in Lazure painting, interior design and murals. She recently founded the Columbine Art Academy in Sussex and London, which offers a diploma recognized by the Arts Section at the Goetheanum. She teaches around the world, most recently in China. Her publications include Colour Dynamics, Easter: Rudolf Steiner’s Watercolour Painting and two books on Creative Form Drawing.